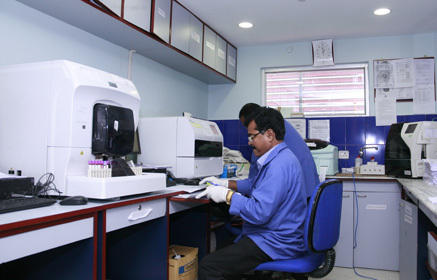 At Quadra we are constantly upgrading our technology to provide rapid and accurate assessment of every patient’s condition so that the right treatment can be delivered swiftly and effectively by specialists. An echocardiogram, often referred to as a cardiac echo or simply an echo, is a sonogram of the heart. Echocardiography uses standard two-dimensional, three-dimensional, and Doppler ultrasound to create images of the heart. Echocardiography has become routinely used in the diagnosis, management, and follow-up of patients with any suspected or known heart diseases. It is one of the most widely used diagnostic tests in cardiology. It can provide a wealth of helpful information, including the size and shape of the heart (internal chamber size quantification), pumping capacity, and the location and extent of any tissue damage. An echocardiogram can also give physicians other estimates of heart function, such as a calculation of the cardiac output, ejection fraction, and diastolic function (how well the heart relaxes). Electrocardiography (ECG) is the process of recording the electrical activity of the heart over a period of time using electrodes placed on the skin. These electrodes detect the tiny electrical changes on the skin that arise from the heart muscle’s electro physiologic pattern of depolarizing during each heartbeat. 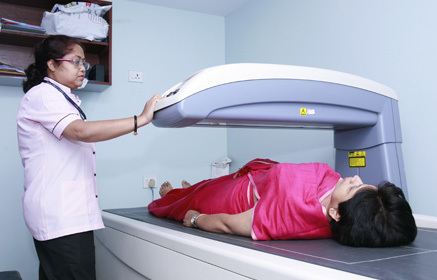 It is a very commonly performed cardiology test. 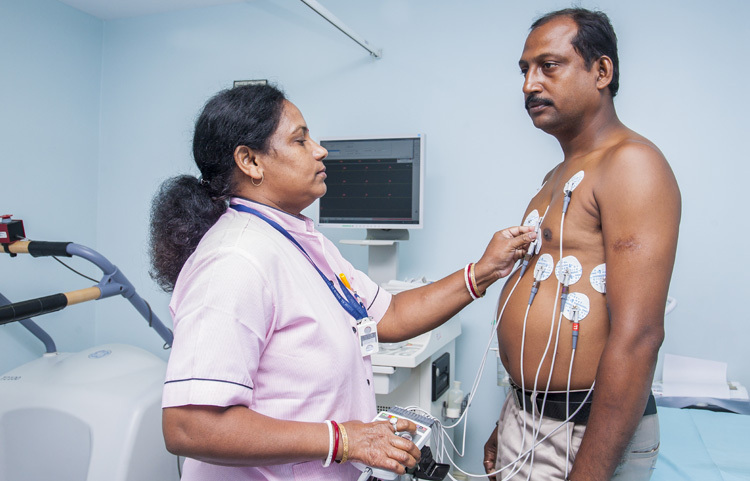 In a conventional 12-lead ECG, 10 electrodes are placed on the patient’s limbs and on the surface of the chest. The overall magnitude of the heart’s electrical potential is then measured from 12 different angles (“leads”) and is recorded over a period of time. In this way, the overall magnitude and direction of the heart’s electrical depolarization is captured at each moment throughout the cardiac cycle. The graph of voltage versus time produced by this non-invasive medical procedure is referred to as an electrocardiogram. Patients with coronary artery blockages may have minimal symptoms and an unremarkable or unchanged ECG while at rest. However, symptoms and signs of heart disease may become unmasked by exposing the heart to the stress of exercise. During exercise, healthy coronary arteries dilate (develop a more open channel) than an artery that has a blockage. This unequal dilation causes more blood to be delivered to heart muscle supplied by the normal artery. In contrast, narrowed arteries end up supplying reduced flow to its area of distribution. This reduced flow causes the involved muscle to “starve” during exercise. The “starvation” may produce symptoms (like chest discomfort or inappropriate shortness of breath), and the ECG may produce characteristic abnormalities. Most commonly, a motorized treadmill is used for exercise. A Holter monitor is a portable device for continuously monitoring various electrical activity of the cardiovascular system for at least 24 hours. 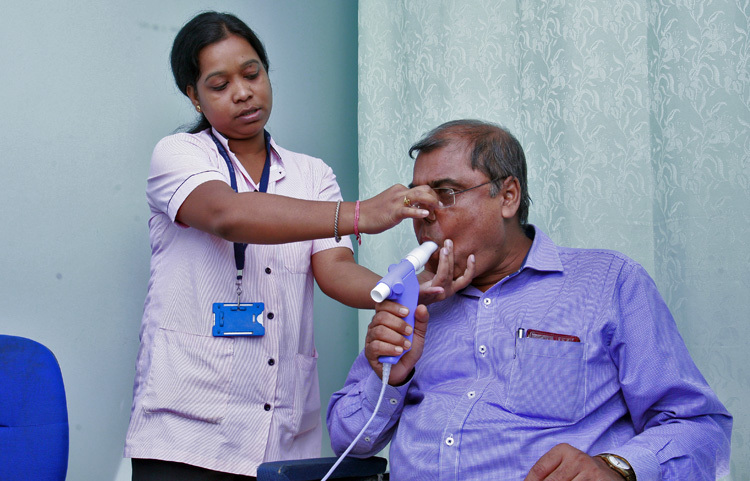 Spirometry includes tests of pulmonary mechanics – measurements of FVC, FEV1, FEF values, forced inspiratory flow rates (FIFs), and MVV. 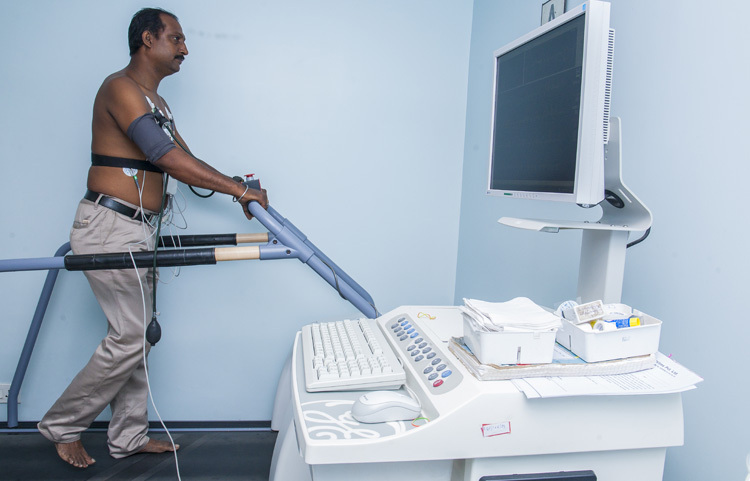 Measuring pulmonary mechanics assesses the ability of the lungs to move large volumes of air quickly through the airways to identify airway obstruction.